PocketITP 1.0 - The Workflow-Oriented FTP Server that Fits in your Pocket! Toronto, ON - October 22nd, 2003 - We are proud to announce the release of PocketITP to the general public. 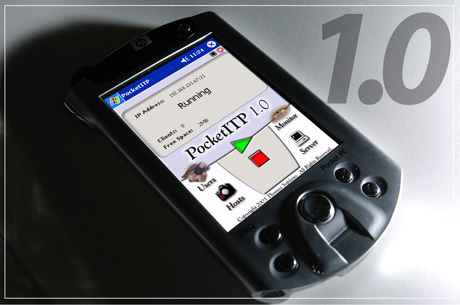 PocketITP brings all of the powerful features of the desktop version of ITP to PocketPC PDAs. Like it's bigger brother, PocketITP is a FTP server that is specifically designed to optimize photographic workflow, with features such as batch renaming, automatic directory generation and more. This package is especially targeted at users of Nikon's WT-1 wireless transmission device, allowing images to be organized the moment they are received by the PDA. Additionally, PocketITP brings a number of new features that are suited to the smaller platform. An all new user-interface design provides simple access designed for these compact devices - allowing you to access many features with a single hand! It also offers special power management features and the ability to switch storage media on the fly if space runs out. These features help to combat the limited resources available, allowing you to work effectively regardless of which type of machine you are using. In addition to the long list of advanced features, PocketITP also has the advantage of being tested against the WT-1 wireless transmitter by Nikon staff. This ensures you that our product will not have any hidden incompatibility and allows you to get to work as soon as possible. The Nikon WT-1 is a potentially powerful device and we are committed to unlocking that potential as much as possible by designing our server to work with it! Memory Card Failover - Due to the limited storage capacity of many PocketPCs, PocketITP offers the ability to automatically switch over to a secondary memory card when the first becomes full. If your PDA offers the necessary hardware this allows you to have as much as 16GB of flash memory constantly available at any given time and prevents the need for manual switching. It also means that full cards can be swapped out without interfering with the opperation of the server in any way. Simple and Intuitive User Interface - Since this package is designed for photographers the UI has been designed to simplify the administration tasks as much as possible. New users can be added quickly and easilly, and it is easy to control where their files are sent. Most features can also be fully configured on a per-user basis, so you can adjust PocketITP's behaviour to suit your needs right on the PDA. Single-Handed Opperation - One of the major advantages that PDAs have above laptops and tabletpcs is that they can often be opperated with a single hand. PocketITP fully exploits this capability by allowing the user to perform many tasks (such as monitoring active users) directly from the five-way controller that every PocketPC is equipped with. This allows photographers to manage PocketITP without having to put down their camera, making it easy to control regardless of the situation you are in. Status Readouts - PocketITP can provide the user with a readout of the ammount of storage space available as well as remaining battery power (if supported by your PDA) on the main window. This allows the user to see at a glance the status of these key resources so that he won't run out unexpectedly. Furthermore, other critical information such as the primary IP Address of the PocketPC, the running status of the server and the number of connected users are displayed as well, providing quick access to this key information without digging into menus!